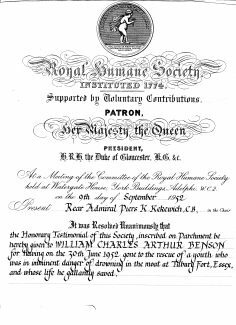 My dad was recognised by the Royal Humane Society for saving the life of a youth who was drowning in the moat at Tilbury Fort. The incident happened on the 30th of June 1952 (a Monday). I wonder who the youth was and what become him? I have found your father’s baptism card and we are cousins. I have left a message on the area where you have your father’s picture with his friends. Please contact me so that we can meet up. I was born in Tilbury and my mother’s maiden name was Benson. She had a brother who I thought was called Charles Arthur Benson. 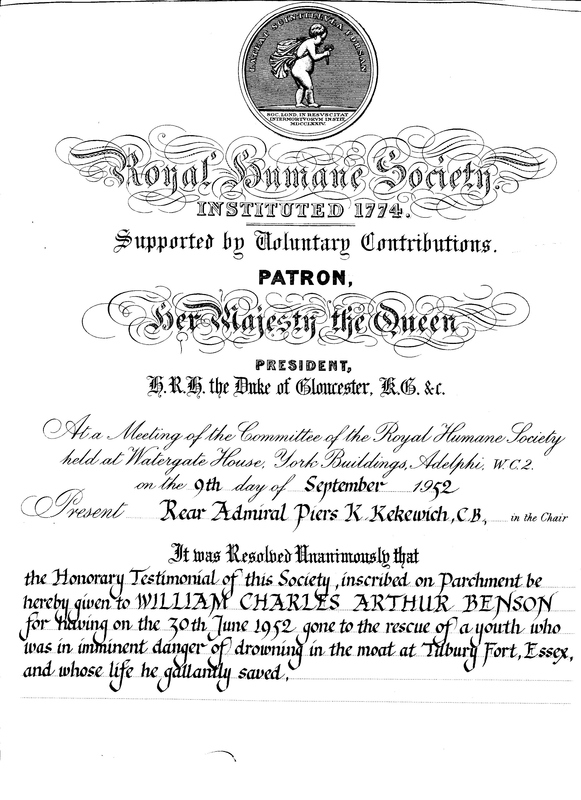 His father’s name was Arthur Charles Benson. We all called our uncle, “Charlie”. He had five children and lived in Fielding Avenue in Tilbury. Could he be the same person? If so we are cousins! !